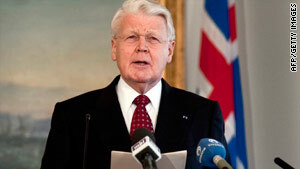 President Olafur Ragnar Grimsson appears on television to say he would not sign the controversial bill. London, England (CNN) -- Britain said Thursday it expects Iceland to live up to its obligations, two days after Iceland's president refused to sign a bill that would pay back billions of dollars Iceland owes the country. Britain spent 2.3 billion pounds ($3.69 billion) last year to cover the losses that British savers incurred when Icelandic banks collapsed. Under a European Union directive, Iceland owes compensation to Britain. Iceland's parliament passed a bill last week authorizing a state guarantee for repayment of the funds, but President Olafur Ragnar Grimmson refused to sign it Tuesday. It means there will now be a public referendum on whether to approve the bill. It also puts into question whether Britain can get repaid. "We expect Iceland to live up to its obligations," said a British Treasury spokesman, who was not authorized to give his name. "We support them in finding a way to do that." Similar comments came from Dutch Finance Minister Wouter Bos, whose government spent 1.3 billion euros ($1.87 billion) to cover bank losses in the country. Despite his refusal to sign the bill, Grimmson told CNN Wednesday that Iceland will not shirk its duty to repay the money. "Iceland recognizes its obligations under this agreement," he said. Resolving the issue, he added, "is a key to our recovery and our harmonious relations with these countries." Grimmson acknowledged that the referendum puts repayment in doubt, though he said at the very least, Icelandic opinion polls show the vote will be "very close." He did not explain how Iceland would repay the money if voters reject the bill. Britain and the Netherlands said it was too early to speculate on what might happen if voters in Iceland vote no, but both Bos and the British Treasury spokesman said it would have negative consequences internationally for the small Atlantic nation. "If the referendum goes against us, then I think Iceland will have a big problem because they will have shown themselves to be very unreliable partners in the international financial scene," Bos told CNN. Bos said non-repayment of the funds would affect "the long-term interest of the Iceland economy and the Iceland people." In a statement Tuesday, Grimmson said the reason he refused to sign the bill was so it would go to a referendum, which is required by law in such a case. He said he received a petition over the weekend, signed by a quarter of the electorate, urging the decision be put to a public vote. "It is the cornerstone of the constitutional structure of the Republic of Iceland that the people are the supreme judge of the validity of the law," Grimmson said in the statement. The law passed by Iceland's parliament would compensate Britain and the Netherlands by 2024. The International Monetary Fund approved a loan of $2.1 billion to Iceland in November, making repayment of the British and Dutch funds a requirement. It is unclear how the IMF loan would be affected if Icelandic voters were to reject the repayment bill.